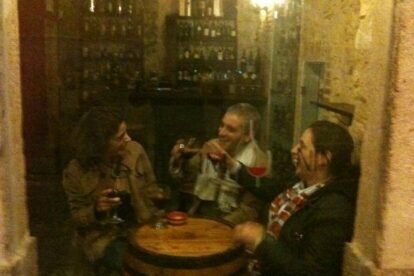 This is a nice and warm bodega in Bairro Alto, right in front of Maria Caxuxa’s bar. But different from this one, Bairru’s is more of a wine bar, a place where I go with my friends to sit, chat and have some wine or sangria. Since I usually don’t drink that much, a couple of glasses is fine for me – it’s a good thing they sell wine by the glass. Of course, if we are with more than three at the table, a bottle is much better. And of course, they sell bottles too. As a companion to good wine and good friends, they play some very good Portuguese music. And the staff is chatty and friendly too, which makes the place even cozier. Recently the bar’s been remodeled and it’s three times the original size now. Luckily, it still keeps its original charm. So, after dining out in Bairro Alto, this is the place to go right after.